In Sweden, as in many other countries, much of the market for new private houses is provided for by kit house manufacturers. In their catalogues you can pick your house from a selection of styles and sizes to put on your lot. The advantage is that the price is more or less fixed and that the construction process is handled by the company. Unfortunately, these houses carry little or no architectural ambition, as they are often designed by company engineers or sales people. 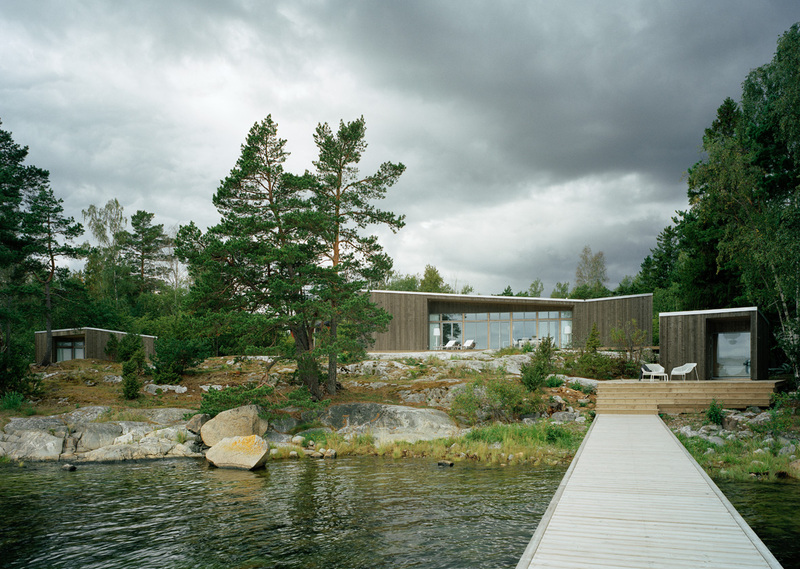 The idea behind the new company, Arkitekthus, is to provide kit houses designed by leading architects at prices competitive with these other manufacturers. 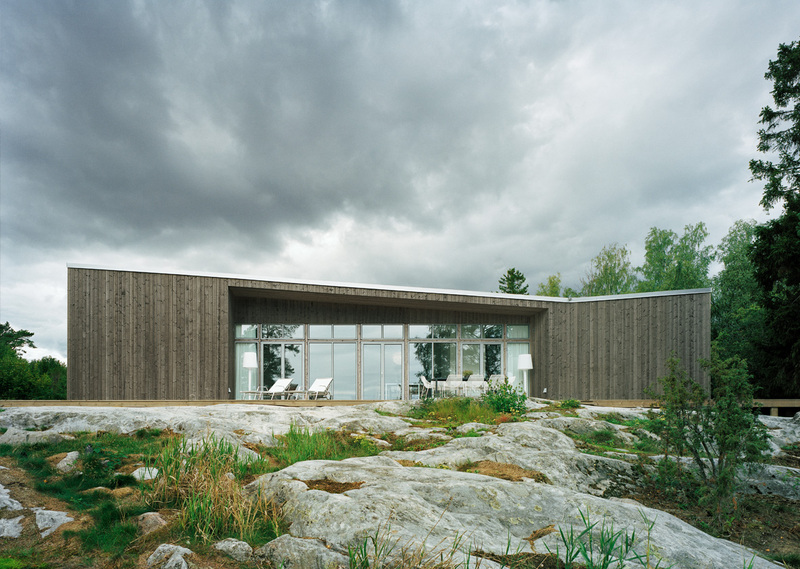 Folded Roof house is our second house for Swedish kit house manufacturer Arkitekthus. It is a one-storey house with an asymmetric folded roof plane. The floor plan provides for separation between private bedrooms and a communal kitchen and living room. The bedrooms are positioned at the gable ends and the living room is between, with an open main facade. The openings are fully glazed and inset into the house volume so that roof-covered terrace spaces serve as continuations of the interior. Another important visual feature is the framing of these insets by the thin wall and roof edges. This was possible because no insulation is needed in the sections located outside of the actual house. 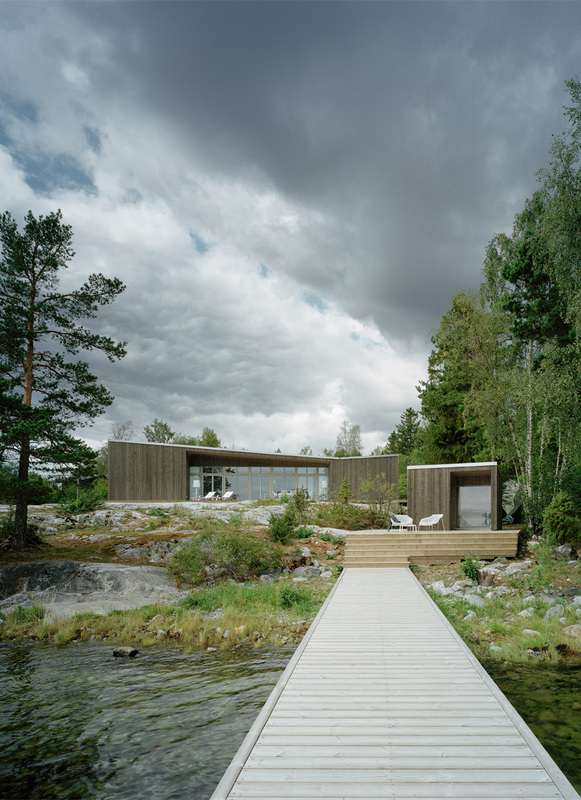 For the site on Muskö island, shown in the images here, the separate guest house and sauna buildings were specifically designed for the client.